First, We’re going to cook up the sausage. If you purchase sausage that is in links, split them in half and dice into bite sized pieces before adding them to your hot skillet. This sausage is red and stays red, so it’s a bit more difficult to know when it’s cooked through. I usually cook mine for at least 5 to 7 minutes on medium high and look for some pieces to be spotty brown. Remove the sausage from the skillet and set it aside. 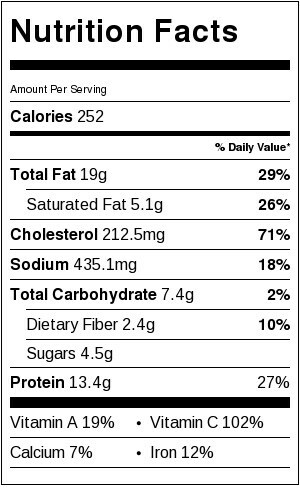 We’ll throw in some veggies to saute in the flavors the sausage has left behind. Two different colors of bell pepper and a yellow onion work great. Once your veggies have softened up, you’ll add some aromatics, seasonings, and a can of fire roasted diced tomato. 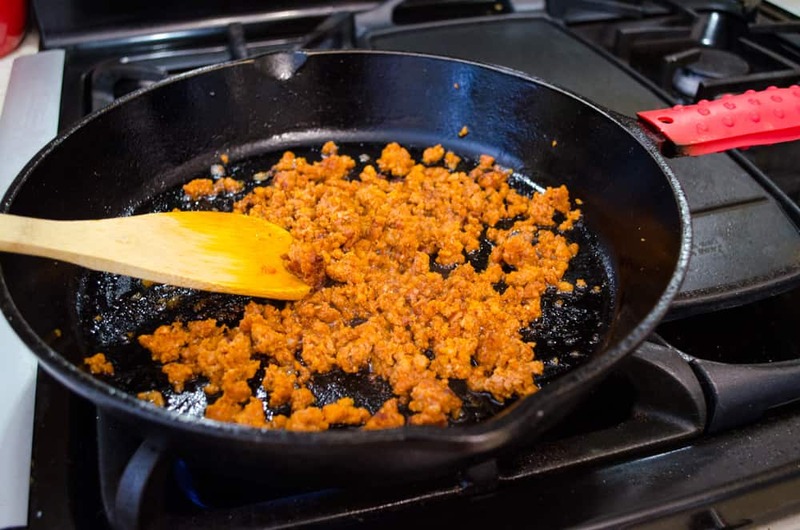 After you add the diced tomato and 1/2 cup water, incorporate the cooked Chorizo back into the skillet. You’ll want to have about 6 eggs ready on the counter. The eggs finish out this recipe and are absolutely delicious in this meal. Make little depressions to hold them and crack them in. The number one thing I love about this recipe: the eggs! Their creamy mild taste is a perfect balance for all the seasonings and flair of the Chorizo. Place a lid on your skillet and cook those eggs to perfection~ and your skillet masterpiece is ready for the table! Garnish this lovely meal with a sprinkle of freshly chopped cilantro (or parsley, as shown) and it looks beautiful, doesn’t it? Dish out an egg and some chorizo-veggie goodness and serve on a thick slice of bread or a warm flour tortilla. Delish in one dish. If your palate is rather mild, have a glass of milk ready in case this dish is a bit spicy for you. I found that it was right at my threshold, and I used mild Chorizo. I may have had a heavy hand with the tabasco sauce too. 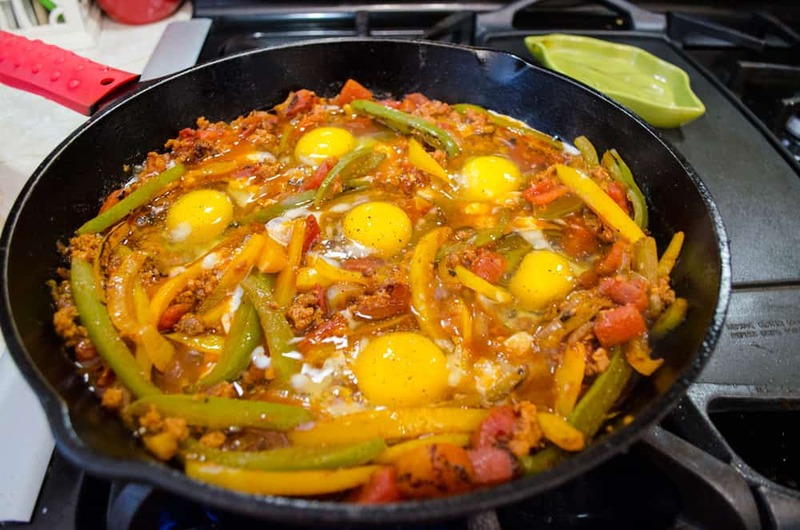 Either way, let me know how this recipe for Egg and Chorizo Skillet Supper turns out for you in the comments below! An easy one dish meal that cooks in less than thirty minutes. 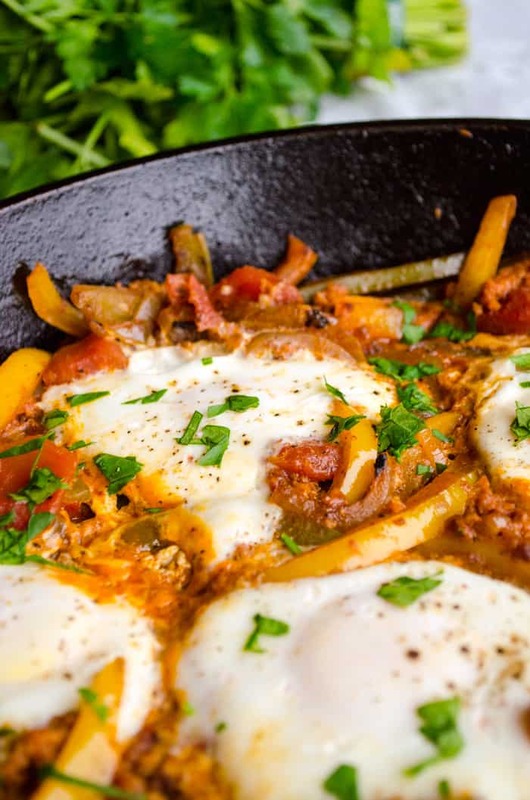 Mexican Chorizo sausage adds a kick to bell peppers, tomato and eggs poached right in the sauce. Serve with warm bread or flour tortillas. Heat 1 tablespoon oil in a 12 inch skillet on medium high heat and add the sausage. Cook thoroughly, about 5 to 7 minutes. Transfer the sausage to a bowl for later. Add another tablespoon of oil (only if very little fat rendered from the sausage) and add in the onion. Cook until it starts to soften, about 3 minutes. stir in the peppers and cover the skillet. Cook until the peppers are soft and beginning to brown in spots, about 10 minutes. Stir in the garlic and cook for about 1 minute. Reduce the heat to medium and add the can of tomatoes, 1/2 cup water, cumin and tabasco sauce. Cook for another 2 or 3 minutes, then add in the chorizo sausage. Make six little 'pockets' for the eggs with a spoon and crack them in. Sprinkle with salt and pepper. Cover and cook until the eggs are just set, 5 or 6 minutes. Sprinkle with fresh herbs and serve. Another wonderful looking dish. I thoroughly enjoy your blog and always look forward to see what your next dish will be. I’ve never seen a breakfast skillet that looks so good until this! 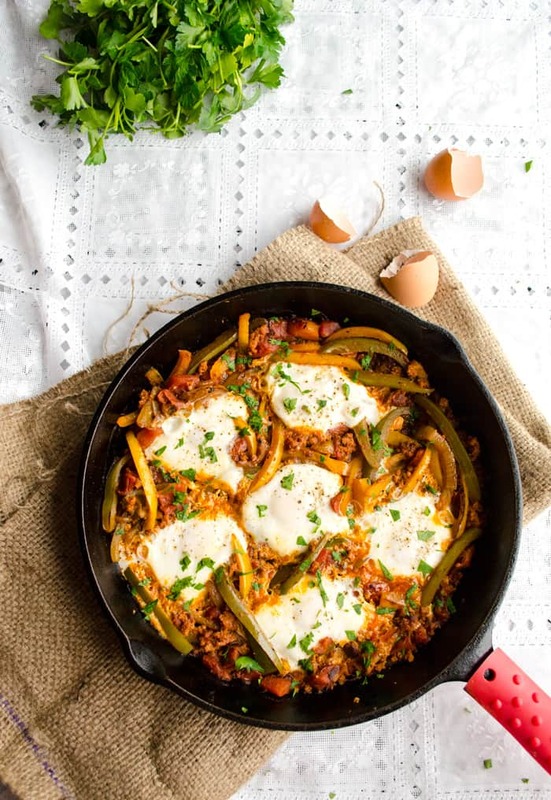 I love chorizo and I and so excited to make this for my family this weekend for family breakfast. I’m sure they will be excited for something different. Thanks for sharing!